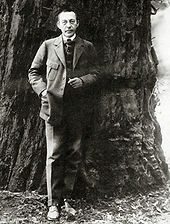 Rachmaninoff, in his later years, toured the United States extensively, and remained there from 1918 until his death. Sergei Vasilievich Rachmaninoff, also commonly spelled in English as Rachmaninov, (Russian: Сергей Васильевич Рахманинов, tr. Sergey Vasil'evich Rakhmaninov) (1 April 1873 [O.S. 20 March]–28 March 1943) was a Russiancomposer, pianist, and conductor. He was one of the finest pianists of his day and, as a composer, very nearly the last great representative of Russian late Romanticism in classical music. Early influences of Tchaikovsky, Rimsky-Korsakov, and other Russian composers gave way to a thoroughly personal idiom that included a pronounced lyricism, expressive breadth, structural ingenuity, and a tonal palette of rich, distinctive orchestral colors. The piano features prominently in Rachmaninoff's compositional output. He made it a point to use his own skills as a performer to explore fully the expressive possibilities of the instrument. Even in his earliest works, he revealed a sure grasp of idiomatic piano writing and a striking gift for melody. Rachmaninoff was born in 1873 in Semyonovo, near Veliky Novgorod, in north-western Russia. He was born into a noble family of Tatar descent, who had been in the service of the Russian tsars since the 16th century. His parents were both amateur pianists. When he was four, his mother gave him casual piano lessons, but it was his paternal grandfather, Arkady Alexandrovich Rachmaninoff, who brought Anna Ornatskaya, a teacher from Saint Petersburg, to teach Sergei in 1882. Ornatskaya remained for "two or three years", until the family home had to be sold to settle debts and the Rachmaninoffs moved to Moscow. Sergei studied at the Saint Petersburg Conservatory before moving alone to Moscow to study piano under Nikolai Zverev and Alexander Siloti (who was his cousin and a former student of Franz Liszt). He also studied harmony under Anton Arensky and counterpoint under Sergei Taneyev. Rachmaninoff was found to be quite lazy, failing most of his classes, and it was the strict regime of the Zverev home that instilled discipline in the boy. In his early years, he showed great skill in composition. While still a student, he wrote the one-act opera, Aleko, for which he was awarded a gold medal in composition, his First Piano Concerto, and a set of piano pieces, Morceaux de fantaisie (Op. 3, 1892), which includes the famous Prelude in C sharp minor. The composer later became annoyed by the public's fascination with this piece, composed when he was 19 years old. He would often tease an expectant audience in the days when it was traditional for the audience to request particular compositions, by asking, "Oh, must I?" or claiming inability to remember anything else. The failure of Symphony No. 1 (1896) long bothered Rachmaninoff. After the horrific reception to the First Symphony came a period of severe depression that lasted three years, during which he wrote virtually no music. One stroke of good fortune came from Savva Mamontov, a famous Russian industrialist and patron of the arts, who two years earlier had founded the Moscow Private Russian Opera Company. He offered Rachmaninoff the post of assistant conductor for the 1897-8 season, which the cash-strapped composer accepted. He also met the bass Feodor Chaliapin through Mamontov's opera company, starting what would become a long, deep friendship. In early January 1900, Rachmaninoff and Chaliapin were invited to Yasnaya Polyana, the home of Leo Tolstoy, whom Rachmaninoff had greatly respected. That evening, Rachmaninoff played one of his compositions, then accompanied Chaliapin in his song "Fate", one of the pieces Rachmaninoff had written after his First Symphony. After they had finished, Tolstoy took the composer aside and started, "Tell me, is such music needed by anyone? I must tell you how I dislike it all. Beethoven is nonsense, Pushkin and Lermontov also." (The song "Fate" is based on the two opening measures of Beethoven's Fifth Symphony.) And when they were leaving, Tolstoy said, "Forgive me if I've hurt you by my comments," and Rachmaninoff replied, "How could I be hurt on my own account, if I was not hurt on Beethoven's?" During this whole time, the Russian Orthodox Church maintained its objection to Rachmaninoff marrying his cousin, Natalia Satina, which only deepened his depression. In 1900, Rachmaninoff began a course of autosuggestive therapy with psychologist Nikolai Dahl, himself an amateur musician. Rachmaninoff quickly recovered confidence and overcame his writer's block. A result of these sessions was the composition of Piano Concerto No. 2 (Op. 18, 1900–01), dedicated to Dr. Dahl. The piece was very well received at its premiere, at which Rachmaninoff was soloist. Rachmaninoff's spirits were further bolstered when, after years of engagement, he was finally allowed to marry Natalia. They were married in a suburb of Moscow by an army priest on 29 April 1902, using the family's military background to circumvent the church. Although he had an affair with the 22-year-old singer Nina Koshetz in 1916, his and Natalia's union lasted until the composer's death. A lesser-known fact is that Rachmaninoff had another outstanding singer protégée. In 1911, at the request of Alexander Ossovsky, Rachmaninoff auditioned, in Kiev, Ossovsky's cousin, young Ksenia Derzhinskaia (1889–1951) and helped to launch her operatic career. She became an eminent singer and prima donna of the Bolshoi Theatre in Moscow. After several successful appearances as a conductor, Rachmaninoff was offered a job as conductor at the Bolshoi Theatre in 1904, although political reasons led to his resignation in March 1906, after which he stayed in Italy until July. He spent the following three winters in Dresden, Germany, intensively composing, and returning to the family estate of Ivanovka every summer. Rachmaninoff made his first tour of the United States as a pianist in 1909, an event for which he composed the Piano Concerto No. 3 (Op. 30, 1909) as a calling card. This successful tour made him a popular figure in America. Nevertheless, he loathed the tour and declined offers of future American concerts. The death in 1915 of Alexander Scriabin, who had studied with him under Zverev, affected Rachmaninoff so deeply that he went on a tour giving concerts exclusively devoted to Scriabin's music. When asked to play some of his own music, he would reply, "Only Scriabin tonight." The 1917 Russian Revolution meant the end of Russia as the composer had known it. With this change followed the loss of his estate, his way of life, his livelihood and essentially his world. On 22 December 1917, he left St. Petersburg for Helsinki with his wife and two daughters on an open sled, having only a few notebooks with sketches of his own compositions and two orchestral scores, his unfinished opera Monna Vanna and Nikolai Rimsky-Korsakov's opera The Golden Cockerel. He spent a year giving concerts in Scandinavia while also laboring to widen his concert repertory. Near the end of 1918, he received three offers of lucrative American contracts. Although he declined all three, he decided the United States might offer a solution to his financial concerns. He departed Kristiania (Oslo) for New York on 1 November 1918. Once there, Rachmaninoff quickly chose an agent, Charles Ellis, and accepted the gift of a piano from Steinway before playing 40 concerts in a four-month period. At the end of the 1919-20 season, he also signed a contract with the Victor Talking Machine Company. In 1921, the Rachmaninoffs bought a house in the United States, where they consciously recreated the atmosphere of Ivanovka, entertaining Russian guests, employing Russian servants, and observing Russian customs. Just as the Rachmaninoff household in the United States strove to reclaim the lost world of the pre-revolutionary Russia of his youth, Rachmaninoff also sought out the friendship and company of some great Russian musical luminaries. In addition to befriending the operatic bass Chaliapin, he was to meet the pianist Vladimir Horowitz in 1928. Though they did meet for dinner, Horowitz never agreed with the criticism of his tempo, and retained his interpretation in future performances of the work. But there was certainly no loss of admiration between the men as a result of the criticism. In 1985, in the movie The Last Romantic, Horowitz said: "Rachmaninoff is a pianist. I played with him (Arturo Toscanini, who is also mentioned in the conversation), Rachmaninoff and we... [plays the beginning of 3rd piano concerto]. He was a wonderful pianist and a nice friend. He was my best friend! First of all he was composer, pianist and conductor. Three things at once and first class, all three, I think so." Due to his busy concert career, Rachmaninoff's output as composer slowed tremendously. Between 1918 and his death in 1943, while living in the U.S. and Europe, he completed only six compositions. This was partly due to spending much of his time performing in order to support himself and his family, but the main cause was homesickness. It was during these years that he traveled the United States as a touring pianist. When he left Russia, it was as if he had left behind his inspiration. His revival as composer became possible only after he had built himself a new home, Villa Senar on Lake Lucerne, Switzerland, where he spent summers from 1932 to 1939. There, in the comfort of his own villa which reminded him of his old family estate, Rachmaninoff composed the Rhapsody on a Theme of Paganini, one of his best known works, in 1934. He went on to compose his Symphony No. 3 (Op. 44, 1935–36) and the Symphonic Dances (Op. 45, 1940), his last completed work. Eugene Ormandy and the Philadelphia Orchestra premiered the Symphonic Dances in 1941 in the Academy of Music. In late 1940 or 1941 he was approached by the makers of the British film Dangerous Moonlight to write a short concerto-like piece for use in the film, but he declined. The job went to Richard Addinsell and the orchestrator Roy Douglas, who came up with the Warsaw Concerto. Grave at Kensico Cemetery. Note English lettering only. Rachmaninoff fell ill during a concert tour in late 1942 and was subsequently diagnosed with advanced melanoma. The family was informed but the composer was not. On 1 February 1943 he and his wife became American citizens. His last recital, given on 17 February 1943 at the Alumni Gymnasium of the University of Tennessee in Knoxville, included Chopin's Piano Sonata No. 2, which contains the famous Marche funèbre (Funeral March). A statue called "Rachmaninoff: The Last Concert", designed and sculpted by Victor Bokarev, now stands in World Fair Park in Knoxville as a permanent tribute to Rachmaninoff. He became so ill after this recital that he had to return to his home in Los Angeles. Rachmaninoff died of melanoma on 28 March 1943, in Beverly Hills, California, just four days before his 70th birthday. A choir sang his All Night Vigil at his funeral. He had wanted to be buried at the Villa Senar, his estate in Switzerland, but the conditions of World War II made fulfilling this request impossible. He was therefore interred on 1 June in Kensico Cemetery in Valhalla, New York. Rachmaninoff wrote five works for piano and orchestra—four concertos plus the Rhapsody on a Theme of Paganini. Of the concertos, the Second and Third are the most popular. He also wrote three symphonies. The second and third symphonies are both considered among his greatest works. Other orchestral works include The Rock (Op. 7), Caprice Bohémien (Op. 12), The Isle of the Dead (Op. 29), and the Symphonic Dances (Op. 45). Works for piano solo include the Preludes, ten in Op. 23 and thirteen in Op. 32. Together with the Prelude in C-sharp minor (Op. 3, No. 2) from Morceaux de fantaisie (Op. 3), they traverse all 24 major and minor keys. Especially difficult are the two sets of Études-Tableaux, Opp. 33 and 39, which are very demanding study pictures. Stylistically, Op. 33 hearkens back to the preludes, while Op. 39 shows the influences of Scriabin and Prokofiev. There are also the Six moments musicaux (Op. 16), the Variations on a Theme of Chopin (Op. 22), and the Variations on a Theme of Corelli (Op. 42). He wrote two piano sonatas, both of which are large scale and virtuosic in their technical demands. Rachmaninoff also composed works for two pianos, four hands, including two Suites (the first subtitled Fantasie-Tableaux), a version of the Symphonic Dances (Op. 45), and an arrangement of the C-sharp minor Prelude. He also wrote a Russian Rhapsody and arranged his First Symphony (below) for piano four-hands. Both these works were published posthumously. His chamber music includes two piano trios, both which are named Trio Elégiaque (the second of which is a memorial tribute to Tchaikovsky), and a Cello Sonata. In his chamber music, the piano tends to be perceived by some to dominate the ensemble. He also composed many songs for voice and piano, to texts by Aleksey Nikolayevich Tolstoy, Alexander Pushkin, Johann Wolfgang von Goethe, Percy Bysshe Shelley, Victor Hugo and Anton Chekhov, among others. Among his most popular songs is the wordless Vocalise. Especially important is Rachmaninoff's use of unusually widely spaced chords for bell-like sounds: this occurs in many pieces, most notably in the choral symphony The Bells, the Second Piano Concerto, the E flat major Étude-Tableaux (Op. 33, No. 7), and the B-minor prelude (Op. 32, No. 10). He was also fond of Russian Orthodox chants. He uses them most perceptibly in his Vespers, but many of his melodies found their origins in these chants. The opening melody of the First Symphony is derived from chants. (Note that the opening melody of the Third Piano Concerto is not derived from chants; when asked, Rachmaninoff said that "it had written itself"). Rachmaninoff's frequently used motifs include the Dies Irae, often just the fragments of the first phrase. Rachmaninoff had great command of counterpoint and fugal writing, thanks to his studies with Taneyev. The above-mentioned occurrence of the Dies Irae in the Second Symphony is but a small example of this. Very characteristic of his writing is chromatic counterpoint. This talent was paired with a confidence in writing in both large- and small-scale forms. The Third Piano Concerto especially shows a structural ingenuity, while each of the preludes grows from a tiny melodic or rhythmic fragment into a taut, powerfully evocative miniature, crystallizing a particular mood or sentiment while employing a complexity of texture, rhythmic flexibility and a pungent chromatic harmony. The composer's friend Vladimir Wilshaw noticed this compositional change continuing in the early 1930s, with a difference between the sometimes very extroverted Op. 39 Études-Tableaux (the composer had broken a string on the piano at one performance) and the Variations on a Theme of Corelli (Op. 42, 1931). The variations show an even greater textural clarity than in the Op. 38 songs, combined with a more abrasive use of chromatic harmony and a new rhythmic incisiveness. This would be characteristic of all his later works — the Piano Concerto No. 4 (Op. 40, 1926) is composed in a more emotionally introverted style, with a greater clarity of texture. Nevertheless, some of his most beautiful (nostalgic and melancholy) melodies occur in the Third Symphony, Rhapsody on a Theme of Paganini, and Symphonic Dances. His reputation as a composer generated a variety of opinions, before his music gained steady recognition across the world. The 1954 edition of the Grove Dictionary of Music and Musicians notoriously dismissed Rachmaninoff's music as "monotonous in texture ... consist[ing] mainly of artificial and gushing tunes" and predicted that his popular success was "not likely to last". To this, Harold C. Schonberg, in his Lives of the Great Composers, responded, "It is one of the most outrageously snobbish and even stupid statements ever to be found in a work that is supposed to be an objective reference." In a poll of classical music listeners announced in October 2007, the ABC in Australia found that Rachmaninoff's Second Piano Concerto came second, topped only by the Emperor Concerto of Beethoven. The Conservatoire Rachmaninoff in Paris, as well as streets in the cities of Veliky Novgorod and Tambov he used to visit, are named after the composer. In 1986, Moscow Conservatory dedicated a concert hall on its premises to Rachmaninoff, designating the 252-seat auditorium Rachmaninoff Hall. As a pianist, Rachmaninoff ranked among the finest pianists of his time, along with Leopold Godowsky, Ignaz Friedman, Moriz Rosenthal and Josef Hofmann, and perhaps one of the greatest pianists in classical music history. He was famed for possessing a flawless, clean and inhuman virtuoso piano technique, which listeners may dismiss as emotional conservatism at the first listen. His playing was marked by precision, rhythmic drive, an exceptionally accurate staccato and the ability to maintain complete clarity when playing works with complex textures. He applied these qualities to excellent effect in music by Chopin, especially the B flat minor Piano Sonata. Rachmaninoff's repertoire, excepting his own works, consisted mainly of standard 19th Century virtuoso works plus music by Bach, Beethoven, Borodin, Debussy, Grieg, Liszt, Mendelssohn, Mozart, Schubert, Schumann and Tchaikovsky. Young Rachmaninoff. Note the hands. Rhythmically, Rachmaninoff was one of the best Romantic performers. He never lost the basic metric pulse, yet he constantly varied it. Harold C. Schonberg suggests the young Vladimir Horowitz might have gotten this kind of rhythmic snap from Rachmaninoff. In addition, Rachmaninoff's playing had extreme musical elegance, with attention paid to the shape of the melodic line. His playing possessed a masculine, aristocratic kind of poetry. While never becoming sentimental, he managed to wring dry the emotional essence of the music. He did so through subtly nuanced phrasing within his strong, clear, unmannered projection of melodic lines. Rachmaninoff possessed extremely large hands, with which he could easily maneuver through the most complex chordal configurations. His left hand technique was unusually powerful. His playing was marked by definition—where other pianists' playing became blurry-sounding from overuse of the pedal or deficiencies in finger technique, Rachmaninoff's textures were always crystal clear. Only Josef Hofmann shared this kind of clarity with him. Both men had Anton Rubinstein as a model for this kind of playing—Hofmann as a student of Rubinstein's and Rachmaninoff from hearing his famous series of historical recitals in Moscow while studying with Zverev. Incidentally, it might not have been a coincidence that the two pieces Rachmaninoff singled out for praise from Rubinstein's concerts became cornerstones for his own recital programs. The compositions were Beethoven's Appassionata and Chopin's Funeral March Sonata. Moreover, he may have based his interpretation of the Chopin sonata on Rubinstein's. Rachmaninoff biographer Barrie Martyn points out similarities between written accounts of Rubinstein's interpretation and Rachmaninoff's audio recording of the work. As part of his daily warm-up exercises, Rachmaninoff would play the phenomenally difficult Étude in A flat, Op. 1, No. 2, attributed to Paul de Schlözer. Along with his musical gifts, Rachmaninoff possessed physical gifts that may have placed him in good stead as a pianist. These gifts included exceptional height and extremely large hands with a gigantic finger stretch. They and Rachmaninoff's slender frame, long limbs, narrow head, prominent ears, and thin nose suggest that he may have had Marfan syndrome, a hereditary disorder of the connective tissue. This syndrome would have accounted for several minor ailments he suffered all his life. These included back pain, arthritis, eye strain and bruising of the fingertips. Many of Rachmaninoff's recordings are acknowledged classics. 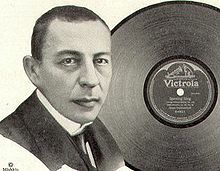 Rachmaninoff recorded first for Edison Records on their "Diamond Disc" records, since they claimed the best audio fidelity in recording the piano at the time. Thomas Edison, who was quite deaf, didn't care for Rachmaninoff's playing and referred to him as a "pounder". Further, Rachmaninoff recorded on an upright piano that the inventor admitted was below average; however, the discs provided the composer with some much-needed income. Rachmaninoff believed his own performances to be variable in quality and requested that he be allowed to approve any recordings for commercial release. Edison agreed but still issued multiple takes, a common practice in the gramophone record industry at the time. This angered Rachmaninoff, and he left Edison and signed a contract with the Victor Talking Machine Company in 1920 and with its successor, RCA Victor. The company was pleased to comply with Rachmaninoff's restrictions, and proudly advertised him as one of their great recording artists. His recordings for Victor continued until 1942, when the American Federation of Musicians imposed a recording ban in the U.S. Particularly renowned are his renditions of Schumann's Carnaval and Chopin's Funeral March Sonata, along with many shorter pieces. He recorded all four of his piano concertos with the Philadelphia Orchestra, including two versions of the second concerto with Leopold Stokowski conducting, and a world premiere recording of the Rhapsody on a Theme of Paganini, soon after the first performance (1934) with the Philadelphians under Stokowski. The first, third, and fourth concertos were recorded with Eugene Ormandy. 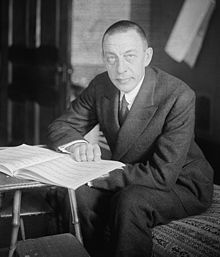 Rachmaninoff also made three recordings conducting the Philadelphia Orchestra in his own Third Symphony, his symphonic poem Isle of the Dead, and his orchestration of Vocalise. Rachmaninoff was also involved in various ways with music on piano rolls. Several manufacturers, and in particular the Aeolian Company, had recorded his compositions on perforated music rolls from about 1900 onwards. His sister-in-law, Sofia Satina, remembered him at the family estate at Ivanovka, pedalling gleefully through a set of rolls of his Second Piano Concerto, apparently acquired from a German source, most probably the Aeolian Company's Berlin subsidiary, the Choralion Company. Aeolian in London created a set of three rolls of this concerto in 1909, which remained in the catalogues of its various successors until the late 1970s. From 1919 he made 35 piano rolls (12 of which were his own compositions), for the American Piano Company (Ampico)'s reproducing piano. According to the Ampico publicity department, he initially disbelieved that a roll of punched paper could provide an accurate record, so he was invited to listen to a proof copy of his first recording. After the performance, he was quoted as saying "Gentlemen — I, Sergei Rachmaninoff, have just heard myself play!" For demonstration purposes, he recorded the solo part of his Second Piano Concerto for Ampico, though only the second movement was used publicly and has survived. He continued to record until around 1929, though his last roll, the Chopin Scherzo in B-flat minor, was not published until October 1933. Rachmaninoff's famous Prelude in C-sharp minor (Op. 3, No. 2), which he composed when he was 19, established his fame in America. It is here performed by himself. Rachmaninoff performing Waltz in E flat major, Op. 18, by Chopin. Recorded on January 21, 1921. Rachmaninoff's music is often quoted, especially themes from his second and third piano concertos, and the eighteenth variation of the Rhapsody on a Theme of Paganini. The soundtrack of the 1945 film Brief Encounter, directed by David Lean, prominently features the second piano concerto played by Eileen Joyce. The 1953 film The Story of Three Loves, directed by Vincente Minnelli, features the Rhapsody on a Theme of Paganini. Tom Ewell's character in the comedy The Seven Year Itch believes a recording of Rachmaninoff's Piano Concerto No. 2 is the key ingredient with which to seduce the character played by Marilyn Monroe. In the motion picture Somewhere In Time (1980) the character played by Christopher Reeve uses the 18th variation of Rachmaninoff's Rhapsody on a Theme of Paganini to win the heart of the character played by Jane Seymour. The action is set in 1912, but the movie involved time travel from the early 1980s to the past, so the piece (premiered in 1934) would have been known to Christopher Reeve's character. In one scene, Reeve's character is humming the tune, Seymour's character asks what it is, and he tells her it is by Rachmaninoff. She says she had heard Rachmaninoff play with "the Philharmonic once. I love his music but I've never heard this piece". In an allusion to that, the movie Groundhog Day (1993) has Bill Murray's character learning to play the same piece. In the 1996 film Shine, which is based on a true story, the pianist David Helfgott is obsessed with Rachmaninoff. Helfgott, played by Geoffrey Rush, enters a piano competition, choosing to play the third piano concerto despite the warnings of a teacher that the piece may be too demanding. Helfgott completes the piece and suffers a nervous breakdown. Bruce Beresford was signed in March 2006 to direct a feature film based on Rachmaninoff's life, as seen through the eyes of his widow, to be called Rhapsody. In the editorial comic strip 9 Chickweed Lane, the primary character Edda is known for playing Rachmaninoff's works with much enthusiasm. Eric Carmen's first two solo singles were based on melodies from Rachmaninoff's Piano Concerto No. 2. The influence of Sergei Rachmaninoff's work (specifically Piano Concerto No. 2 in C minor and also Piano Concerto No. 3 in D minor) can be heard in the songs "Space Dementia" and "Butterflies and Hurricanes" by Muse. Matthew Bellamy of Muse has cited Rachmaninoff, Liszt, and Chopin as a source of inspiration. In 2010, a newly discovered 290-kilometre-wide impact basin on Mercury was named Rachmaninoff. In the television show Lost, episode 9 of season 4 "The Shape of Things to Come" the character Ben Linus plays Rachmaninoff's Prelude in C sharp minor. ^ Note: Sergei Rachmaninoff was the spelling the composer himself used while living in the West throughout the latter half of his life. However, alternative transliterations of his name include "Sergej Vasil'evič Rahmaninov" (ISO 9:1995 & GOST 7.79 System A), "Sergej Vasil'evich Raxmaninov" (GOST 7.79 System B), "Sergeĭ Vasil'evich Rakhmaninov" (ALA-LC), "Sergej Vasil’evič Rachmaninov" (ISO/R 9:1968), "Sergey Vasil'yevich Rakhmaninov" (BGN/PCGN) & "Sergej Vasil’evič Raxmaninov" (scientific transliteration) as well as Serge, Rachmaninow, and Rakhmaninoff (and other versions; Russian transliteration can vary between languages). ^ http://www.naxos.com/person/Sergei_Rachmaninov_21001/21001.htm. Naxos. Retrieved 2010–07–25. ^ Geoffrey Norris. "Rachmaninoff, Serge. " In Grove Music Online. Oxford Music Online, http://www.oxfordmusiconline.com/subscriber/article/grove/music/50146 . Retrieved November 11, 2009. ^ Norris, New Grove, 2nd. ed. , 707. ^ Shelokhonov, Steve (2007). "Biography for Sergei Rachmaninoff". IMDb. http://www.imdb.com/name/nm0006245/bio. Retrieved 2007-12-14. ^ a b Norris, New Grove, 15:550. ^ "Talk Classical". Talk Classical. 1943-03-28. http://www.talkclassical.com/2507-sergei-rachmaninoff.html. Retrieved 2010-03-13. ^ a b Norris, New Grove, 2nd. ed., 709. ^ Ossovsky Alexander Viacheslavovich (1871-1957), renowned critic and musicologist and close friend of Rachmaninoff, see external links. ^ Also see, Harrison, Max (2006). Rachmaninoff: Life, Works, Recordings. Continuum,London, p.77. ^ Geraint Lewis. "Programme notes for Proms performance of Glazunov's Violin Concerto". BBC. http://www.bbc.co.uk/proms/aboutmusic/glazunov_violincon.shtml. ^ Norris, New Grove 2nd Ed., 709-710. ^ See Osssovsky's memoir about Rachmaninoff, external links. ^ a b Norris, New Grove, 15:553. ^ Norris, New Grove, 15:554. ^ a b Plaskin, Glenn, Horowitz, a biography,, 107. ^ a b c About Wizard Horowitz, Who Will Return Soon, The Milwuakee Journal, Google News. Retrieved March 14, 2010. ^ Part of the movie "The Last Romantic"
^ "Sergei Rachmaninoff Biography". 8notes. http://www.8notes.com/biographies/rachmaninoff.asp. Retrieved 2008-03-02. ^ "Richard Addinsell - Films as composer". filmreference.com. http://www.filmreference.com/Writers-and-Production-Artists-A-Ba/Addinsell-Richard.html. Retrieved 2008-10-10. ^ Cunningham, Robert (2001). Sergei Rachmaninoff: a bio-bibliography - Google Books. Books.google.com. ISBN 9780313309076. http://books.google.com/?id=k2YrwE8GaLEC&pg=PA6&lpg=PA6&dq=rachmaninoff+american+citizenship&q=rachmaninoff%20american%20citizenship. Retrieved 2010-03-13. ^ Norris, New Grove, 15:554-555. ^ Norris, New Grove, 2nd ed., 713. ^ Harrison, Max (2006). Rachmaninoff: Life, Works, Recordings. London: Continuum. ISBN 0-8264-9312-2. http://books.google.com/?id=HwSvhu1kLikC. ^ Norris, New Grove 2nd ed., 714-715. ^ Yasser, Joseph (1969). "The Opening Theme of Rachmaninoff's Third Piano Concerto and its Liturgical Prototype". Musical Quarterly LV: 313–328. doi:10.1093/mq/LV.3.313. ^ Norris, New Grove 2nd ed., 715. ^ This may have been due to Rachmaninoff's main publisher, Gutheil, having died in 1914 and Gutheil's catalog being acquired by Serge Koussevitsky. (Harrison, 191). ^ a b Norris, New Grove, 2nd ed., 716. ^ a b Schonberg, Composers, 520. ^ a b Norris, New Grove 2d ed., 714. ^ Schonberg, Virtuosi, 315, 317.